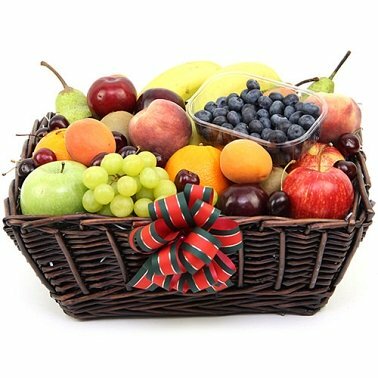 This is an exquisite assortment of fresh fruits carefully assembled in a beautiful wicker basket finished off with a stylish ribbon.The basket is a lovely gift hamper for any special occasion like Christmas, Anniversary, Birthday, Thanksgiving or for any other such joyous moment of enjoyment. You can choose this basket to be sent to a large family or for a special gathering at your relatives. Enjoy sending this seasons best fruit basket by post to UK with your personal message card attached.